But the light that does sneak past Earth is mostly reddish-orange. That’s because the sunlight has been scattered. 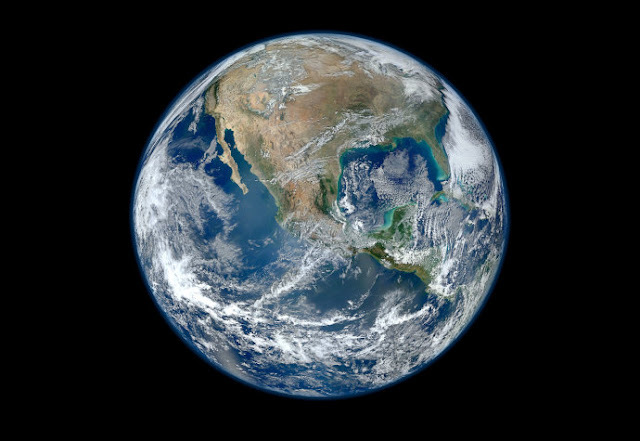 The light creeping around the sides of our planet is passing through a lot of atmosphere, and all of the molecules in our air cause certain types of light to, well, scatter. Light will bump up into tiny particles of nitrogen and oxygen, which flings the light outward in all directions. But this effect is more pronounced for light on the blue end of the spectrum, which has much shorter wavelengths. It bumps into all these molecules more easily, while red light, with it’s much longer and more stretched-out wavelengths, can slip through. This scattering effect is the same reason why our sky is blue during the day, and reddish-orange at sunset. When the Sun is high in the sky, blue light gets scattered the most in all directions, with a lot of it getting directed toward our eyes. But when the Sun is at a low angle on the horizon, its light has to pass through a lot more atmosphere to reach our eyes, and that filters out blue light even more. So that’s why the reds and yellows make it through. And You Said This Moon Is Super, Too. Does It Have Powers? Sorry, but our Moon is the same old Moon its been for millennia. The name just means that this is a full Moon that will be at its closest distance to Earth on its trip around our planet. See, the Moon doesn’t revolve around Earth in a perfect circle, but more of an ellipse. That means its distance from Earth changes throughout its orbit. Supermoons are when the Moon is about 225,744 miles, or 363,300 kilometers, away. That makes them appear about 14 percent bigger and 30 percent brighter than your average full Moon. What’s This I Hear about a Super Blood Wolf Moon? 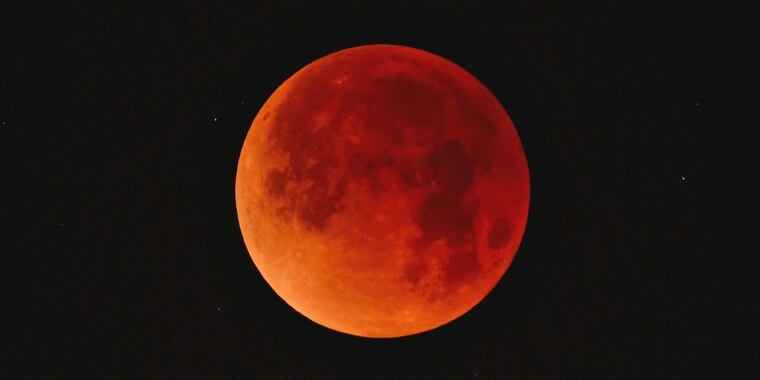 Yes, some have been referring to this event as a Super Blood Wolf Moon. But the “wolf” part of the name simply refers to the fact that this is a full Moon in January. Indigenous tribes in North America used to keep track of the seasons by observing the full Moons, according to the Farmer’s Almanac, so they would give these events names. This title supposedly refers to all the wolves that “howled in hunger outside the villages” in January, according to the Almanac. When And Where Can I See This Thing? 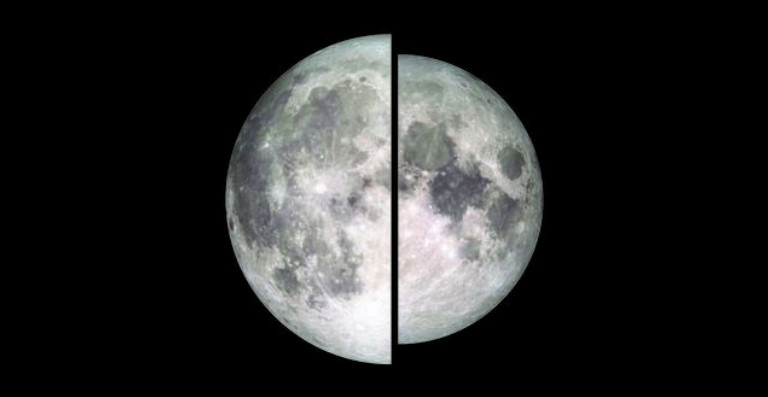 Things get underway at 9:36PM ET, when the Moon enters Earth’s penumbra, or the outer part of the shadow. At that time, the Moon will start to dim, but only slightly. About an hour later at 10:33PM ET, the Moon starts to enter the umbra, the bulk of Earth’s shadow. That’s when things get juicy, because it will look like half of the Moon has disappeared. 11:41PM ET: Moon is fully inside umbra. 2:48AM ET: Moon completely out of the penumbra. The show’s over! 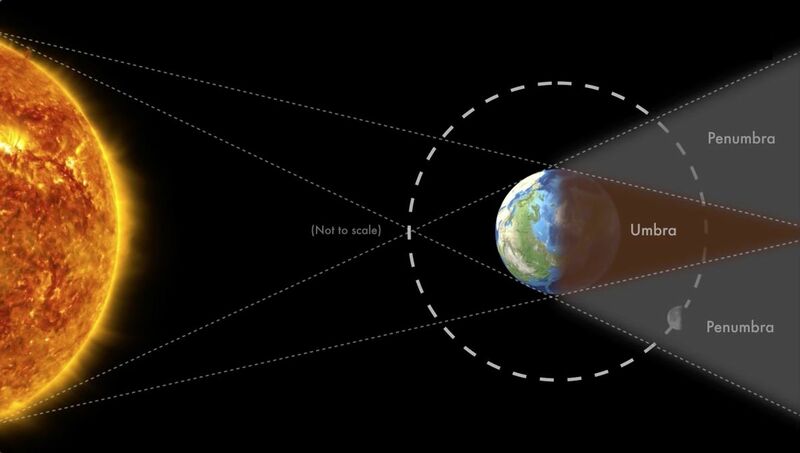 The total lunar eclipse will be easily visible for anyone living in North America or South America, weather permitting. But parts of Europe, Africa, and Asia will be able to see some of the event, too. For those outside of the Americas, the eclipse will coincide with Moon rise and Moon set. That means it may be hard to see, because the Moon will be too low in the sky or the pesky Sun will make things too bright. Check out how your location fares in the map below. Okay I Have Plans, Though. Is This Really The Only Lunar Eclipse Of The Year? Well, it’s the only total lunar eclipse of the year. There’s a partial lunar eclipse in July, which means the Moon won’t be fully inside Earth’s shadow. But plenty of it will be covered. That one will be easily seen from Africa, Europe, and parts of Asia. So for those in North America, this one is your best bet for 2019, and for a good chunk of 2020, too. And if lunar eclipses are too weak for you, there’s always a total solar eclipse coming up this year in July. Those located in Chile and Argentina will get a great view of that one just before sunset. So start making your vacation plans now.